Ratings are based on a 1 to 5 scale. 1 is bad. 3 is average. 5 is great. Quite soon, Child of Night will officially be an “old-school” card (as far as such things are objective). Its first appearance was almost ten years ago. Where does the time go? I like that we now have a version with no reminder text and suitably creepy updated art. I feel that it makes the flavor text easier to scan for, but more importantly, it’s an advantage in silver-bordered games! Compared to the full range of creatures at its converted mana cost, Child of Night is merely solid, but we’re so used to seeing the Dark Confidants and Snapcaster Mages of the world at the top tables, we sometimes forget that “merely solid” is good too. Those top tables live and die on card advantage and speed, and Child of Night doesn’t reach the highest level on those measures. The life advantage can add up, but barring something like Searing Meditation or some kind of Well of Lost Dreams engine, that’s not always relevant when your opponent is looking for elder dinosaurs or Valakut or whatever. But this is the kind of card you’ll never feel bad about playing in limited or in more casual settings. 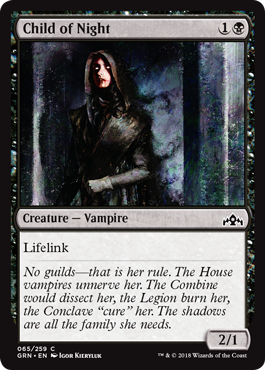 Child of Night has been around for a fair while, and it is a simple creature: a 2/1 with lifelink for 2. It’s not particularly powerful; lifelink is good, as is 2 power (to potentially trade with a number of 1-drops), but the lack of toughness means it has a hard time having an impact as the game goes on. Vampire can be nice when vampiric tribal synergies are abound, but this Standard is not one. It’s great in Limited for its flexibility, but look elsewhere in other formats. Visit the Magic Card of the Day Archive! Click here to read over 4,000 more MTG Cards of the Day! Daily Since 2001.